Wouldn’t you really like that your logo or a brand leaves a classy and quality rich impression? 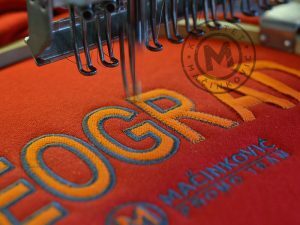 Embroidery is the technique that will make it happen, as it implies tight connection to the material applied on, of course – textile. Texture left by embroidery leaves a sense of top quality and durability under your fingertips, both of the material as well as of the message of the brand it is embroidered onto a cap, T-shirt, jacket, uniform or workwear… Embroidery is a technique that used to ask for great precision and skill, today is applied to a textile material by using a computer. 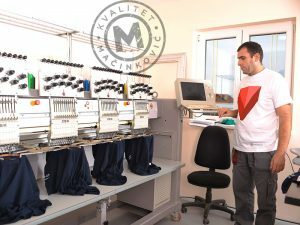 One of the basic advantages of the embroidery technique is the durability of the final product. 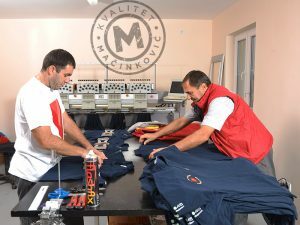 Printing House Mačinković has a large specter of colored cottons that would make it virtually impossible for you not to find the exact one you are looking for.